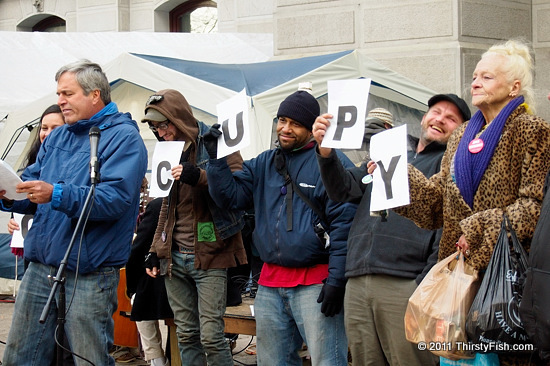 This photo was taken a few weeks ago at the Occupy Philadelphia camp. Things have changed for the Occupy Movement since then. The occupiers at Occupy Portland and Occupy Oakland were evicted from their camps in the last few days. Yesterday, the NYPD shutdown Occupy Wall Street. Occupy Philadelphia is considering relocating. In an earlier post, I had mentioned that it was unclear whether the Occupy Wall Street or The Tea Party movements would have a lasting impact. Even if movements such as these do not last, we are lead to believe that you can not shutdown ideas. But many ideas and ideals, such as those which were fundamental to the foundation of this nation, have already been shutdown. Occupy Wall Street and to a degree The Tea Party are merely trying to reinstate some of those ideas. The most effective way to shutdown ideas is to hijack them. The Tea Party has become the defender of deregulation which in fact has been the cause of the the financial crisis. Even, Alan Greenspan, the chairman of the Federal Reserve from 1987 to 2006, who pushed deregulation has conceded that it was an error. Similarly, some of the people that have been hurt most by the current Health Care System are its fiercest defenders and many of them are against any overhaul of the system. All this may seem nonsensical or impossible until we understand that many of us are in fact zombies. An example of this in nature is Zombie Ants. It has been found that a Zombie Ant is mind controlled by a parasitic fungus which guides it to the vein of a leaf and instructs it to clamp its jaws around the vein till it dies. The fungus then thrives in this perfect location. It's not the zombie, it's the parasite that is the problem.